Amy Yu, 16, and Kevin Esterly, 45, disappeared on Monday, March 5. 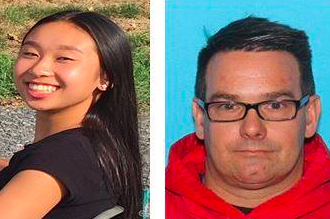 Lehigh Valley authorities said missing teenager Amy Yu and the family friend she is believed to have run off with flew to Cancun, Mexico, on the day Yu was reported missing. At a press conference Friday afternoon, Allentown Police Capt. Bill Lake said Yu and Kevin Esterly, 45, purchased one-way airline tickets from Philadelphia International Airport to Cancun, with a stop in Dallas. Their flight took off around the same time Yu's mother reported her daughter missing, Lake said. Authorities in Mexico issued an Amber Alert late Thursday night for Yu, who was last seen by her family on March 5 at a bus stop in Allentown. Police say she never went to school that morning and instead left town willingly with Esterly, a father of one of Yu's friends. Lake thanked the public for sharing news of the case and ask that they "remain engaged" as authorities continue their search. "We are asking the media to relay a message to Amy, that her mom and brother are very worried about her. They miss her. They're very concerned and want her to come home," Lake said. Lake also addressed Yu, suggesting that she go to law enforcement in Cancun or a resort staff member if she would like to return home but is unsure of how to do so. Lake also encouraged the teen to reach out to Lehigh Valley-area authorities or a family member on social media. "We will work to get you united with your family as soon as possible," Lake said. Allentown police issued an alert on Wednesday saying they suspected the girl was with Esterly, who authorities allege had a secret relationship with Yu. Esterly reportedly checked Yu out of Lehigh Valley Academy Charter School nine times between November 2017 and February of this year. Yu had listed Esterly as her stepfather on school records, according to authorities. He was barred from school grounds on Feb. 9 after the girl's mother, Mui Luu, found out Esterly had been signing her daughter out of school without her permission. Luu told CBS News she also found text messages suggesting the two were romantically involved. According to ABC News, Esterly's wife claims he took out $4,000 from her bank account and that his car and personal documents are missing. While Yu is 16, the minimum age of consent in Pennsylvania, authorities have charged Esterly with interfering with the custody of children and have put out a warrant for his arrest. The Mexico Amber Alert said investigative efforts reveal Yu may be with Esterly "traveling in national territory." Yu is described as an Asian female standing 4 feet 11 inches tall and weighing about 90 pounds. Esterly is a white male, 5 feet 9 inches. tall and weighing around 185 pounds. The two may be traveling together in a 1999 red Honda Accord with the Pennsylvania license plate number "KLT 0529." Anyone who sees Yu and Esterly or has information on their whereabouts is asked to contact Allentown Police at (610) 437-7751.